It's Not Work, It's Gardening! : It's drinking the water! The pond has already been teaching me interesting things; surprising me in many ways. 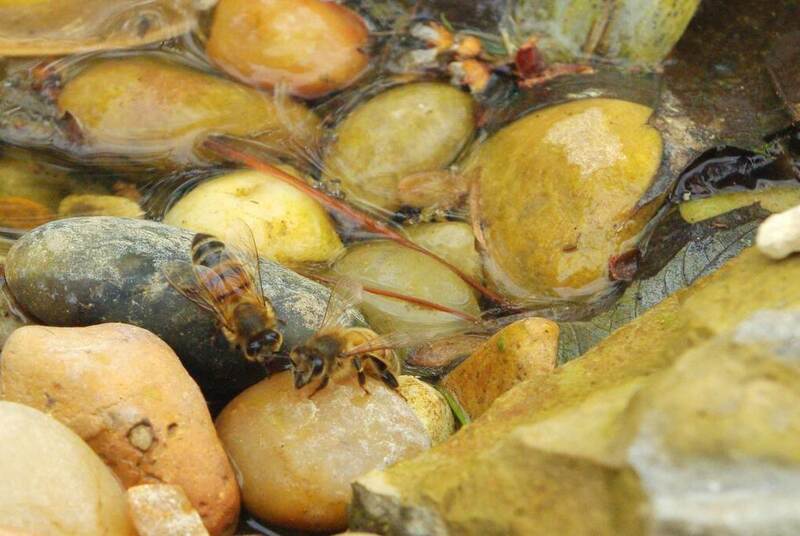 One of the surprising things is the honeybees, and their constant drinking of the water. 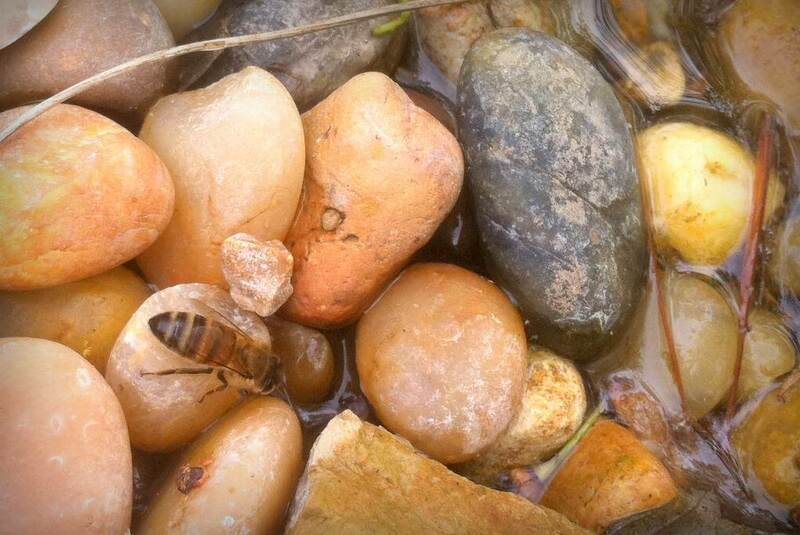 I'm no expert on bees and their behaviors (but they are at Curbstone Valley Farm) but I'm pretty sure these bees are not thirsty -- they're most likely using the water to cool the hive. A very quick Internet search told me that they may also be feeding the water to the brood (the developing young), or using it to dilute the honey so they can eat it. I'm still guessing that cooling is the main focus here, as it's been around 90ºF (32ºC) the last few days. Whatever the reason, I'm happy that they're using the pond. I tried following their flight path as they left full of water, but couldn't. I assume the hive is nearby, but who knows how far they'll fly for a good source of water. I'm not going to try and follow them for two blocks... although it might be fun. Have I mentioned how much I'm enjoying this pond? 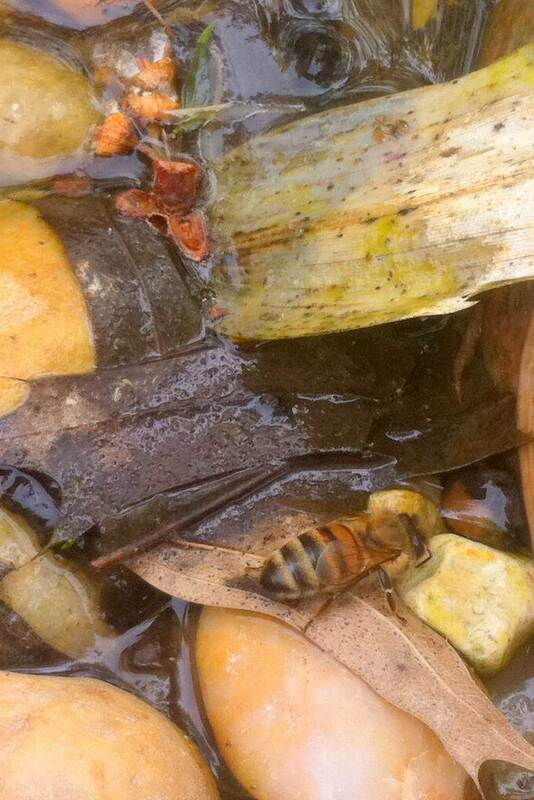 I remember watching wasps at wet muddy places. I thought they gather moisture and/or mud to help build the hive. Bees I see on picnic tables sipping splashes, I thought they use the moisture the same. It will be interesting to find out for sure. Love the video and all the sounds! Busy, busy bees. This is so interesting. I have seen them at the birdbath...perhaps for those reasons. Very cool! No pond yet at our place, but I am very busy getting this Spring's gardens underway! 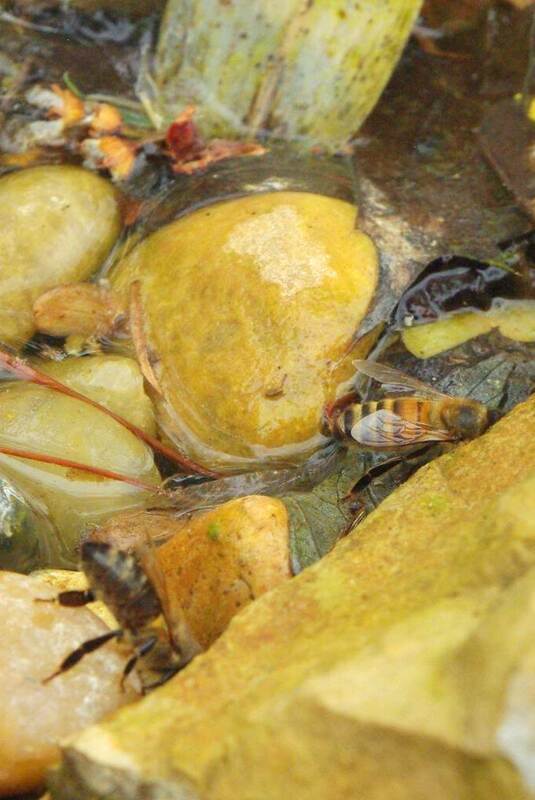 We've marveled at the number of bees that are attracted to our waterfall. It was a happy surprise! Seeing the insects and birds enjoying our little manmade paradise is so much fun!